Companies with multiple look-back periods may add additional periods of measure based on the employees’ eligibility class. Learn how to set up and track varying periods of measure based on employee class, division and rate type. The feature of identifying added look-back periods provides the employer with the opportunity to setup and track varying periods of measure based on employee class, division and rate type. Click Add to setup the additional look-back periods. From the drop down list, select the plan year for which the look-back period is associated with. Example: If the look back period is 12/01/2014 – 06/30/2015 for the plan year beginning 08/01/2015, then you should select 2015. In the next two fields you will first identify a duration (1-90 days) for the timeframe for the administrative period for current employees and then identify the duration for new hire employees within the same class. Enter the Administrative Period Start Date (MM/DD/YYYY). Keep in mind, because the administrative period start date will vary for new hires depending when they were hired, this date is specific to current employees as their cycle is static. Finally, provide the duration and start date for your stability period. Remember, the year identified in the stability period start date should mirror the year selected within the drop down (Reference step 4 above). 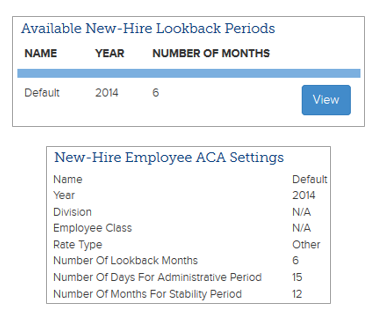 NOTE: The Lookback period for New Hires is automatically created for employees within the same class.